Marshall M. Fredericks Sculpture Museum | Plasteline model for "Eastern Civilization" for the "Cleveland War Memorial: Fountain of Eternal Life"
In the center of the sculpture is the elephant-headed god Ganesh. To his left are two figures kneeling in prayer. The head and neck of a bull form the left end of the sculpture. Considered a sacred animal in India, Hindus view the bull as a symbol of fertility and plenty. Fredericks gained appreciation of Indian culture while stationed in India during World War II. 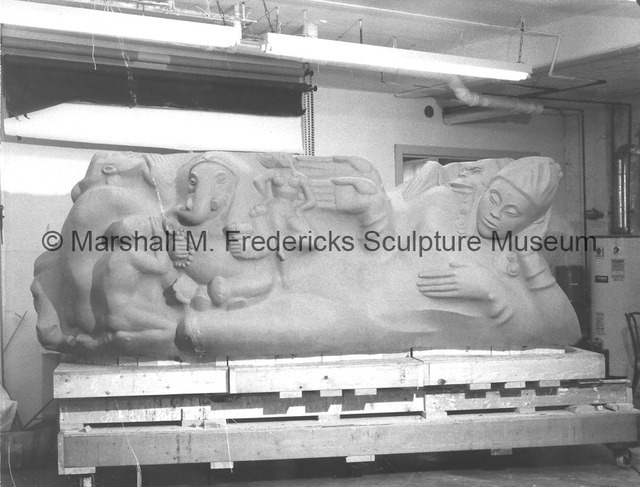 “Plasteline model for "Eastern Civilization" for the "Cleveland War Memorial: Fountain of Eternal Life",” Marshall M. Fredericks Sculpture Museum, accessed April 22, 2019, http://omeka.svsu.edu/items/show/896.